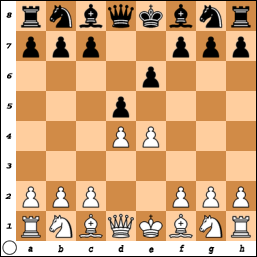 The French Defense begins with 1. e4 e6, and usually continues with 2. d4 d5. Black plans to play a solid setup and contest white's center with moves like ... c5 and ... Nc6. The biggest drawback to the French Defense is that black's light square bishop is hemmed in by the e6 pawn. White has several options against the French Defense including 3. Nc3 (the main line), 3. Nd2 (the Tarrasch Variation), 3. e5 (the Advance Variation), and 3. exd5 (the Exchange Variation).